Grey is a photo installation consisting of hundreds of images derived from video recordings made at Peter Eisenman’s Memorial to the Murdered Jews of Europe in Berlin. As the title indicates the work concentrates on events recorded within a 12 minute and 30 second slice of time, from which images are taken every other second and presented sequentially in horizontal rows. The installation visualizes the progression of time in a spatial image which scrutinizes the borders between video and photography, between still and moving images. The paths which run through the monument have been continuously traversed and filmed from different perspectives while encountering the people who are wandering amidst the pervasive grey stone blocks. 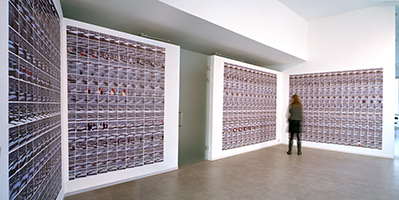 When presented as an installation the succession of tightly packed images spread over several walls envelopes the viewer in a dizzying play of shifting views. For each installation the work is shown in different dimensions in order to fit the particular space in which it is presented.